Coming into Monday’s match-up, the U.S. Men’s National Team and Slovakia are on opposite ends of the standings. At 1-1-0-0 (W-OTW-OTL-L), Team USA is in third place in the group, just one point behind leaders Finland and Switzerland. Slovakia, meanwhile is winless through its first two games and sits sixth in the Helsinki group. The U.S. will meet Slovakia at 1:15 p.m. EDT live on NBC Sports Network. Due to Slovakia’s rough start, which included a 3-2 loss to Canada and 1-0 shutout at the hands of Finland, they might actually be a dangerous team. Though Slovakia will have a chance to make up some ground against teams like France and Kazakhstan potentially, a loss to the Americans makes it an awfully steep climb to make the medal round. Only the top four teams in each group make it out. A team with that much to lose can cause concern. The U.S. meanwhile is coming off an emotional 5-4 overtime win over Canada and thoroughly handled France 7-2. Team USA’s 12 goals for is a tournament high, while its plus-6 goal differential is also tops at the tournament. It’s always tough to gauge momentum at this event and whether it really matters. Team USA is still coming together and learning how to play with each other, but through two games have put together some pretty solid performances. Can they keep it up? Coming up after the jump, some more notes on Monday’s match-up, as well as a look at key players for each team and some links. Though Slovakia has lost twice, each loss was by just one goal, so they’ve been a tough out each time. That said, the lack of goal-scoring, with only two so far, is a concern for Slovakia. The U.S. has fallen victim to a few defensive miscues in this tournament and Slovakia should have enough skill to capitalize should Team USA’s D loosen up a bit. Tomas Tatar, a Detroit Red Wings prospect that played in the AHL this year, gives Slovakia a pretty skilled youngster who can find the back of the net. Slovakia’s D should also give the U.S. some challenges, especially big Zdeno Chara. Having the captain of a team that won the Stanley Cup last year isn’t bad, right? There’s also Andrej Sekera from Buffalo, who can be a good two-way defender. Slovakia has had a different starter for each game so far in net. Peter Hamrlik made 27 saves while allowing three goals to Canada, and Jan Laco allowed just one goal to Finland. Who gets the nod against the U.S. is unclear. (UPDATE: Per Finnish reporter Matias Strozyk, Laco will start in goal, and San Jose forward Michal Handzus has been added to the roster). Team USA will need to shore things up a little bit defensively, but the offense has been clicking. There’s really no need to change a lot up front, and I wouldn’t anticipate any line juggling out of Scott Gordon. When you’ve gotten 12 goals out of your team through two games, there’s not much to complain about or tweak. Despite those few costly mistakes, the American D corps has been good. Limiting mistakes and continual adjusting to the bigger ice sheet should be enough to hold the Slovaks in check. You don’t want this highly mobile D to lose much of that offensive flair that the guys on the back end can bring. Five of Team USA’s seven defenseman have at least one point, which helps contribute to Team USA’s dominant offense. The U.S. will have to be ready for a very hungry team though. Slovakia has its back against the wall right now and will fight to the final whistle. Should be a great tilt between two hockey powers. Bobby Ryan — Ryan hasn’t really stood out significantly in either of Team USA’s first two games, despite posting a goal and an assist. The line of Ryan, Paul Stastny and Max Pacioretty is likely going to draw a lot of attention from Chara. With that in mind, Ryan is going to have to step up his game to create opportunities and get those quality scoring chances. He seems to be getting more comfortable out there and is clearly expected to produce. This could be a good chance to prove he can be a go-to guy. Paul Stastny — Stastny has quietly put up three assists, which puts him in a tie for second among American point-getters. However, it has been the faceoff circle where Stastny has really impressed. He’s won 71 percent of the draws he’s taken through two games, which gives the U.S. a go-to centerman for key faceoffs. Stastny has also been creating for his linemates, as the pass-first guy between two 30-goal scorers. It’s suiting Stastny well. Also, Stastny might have a little extra jump playing against Slovakia, as it is his father Peter’s home country. The younger Stastny, who was born in Quebec and raised in the U.S., also holds Slovakian citizenship. It should be a great experience for him. Cam Fowler — One of Team USA’s youngest players has seemed to get better with each shift out there. Fowler has played with Jack Johnson on Team USA’s top D pairing, and while the captain has been getting more ink, Fowler deserves some credit, too. He plays in pretty much any situation and hasn’t really struggled in his own end. Fowler is certainly more of a puck-mover, but more than anything else, he’s shown tremendous poise with and without the puck and offers a pretty steady presence on the back end. He is third among all U.S. players (by one second) in total ice time (38:22). This might be the beginning of a big tournament for Fowler. Zdeno Chara — It’s pretty obvious why Chara is on this list. He’s a former Norris Trophy winner in the NHL and is just a year removed from captaining the Stanley Cup Champion Bruins. He’s the brightest star on this roster that doesn’t have a whole lot of recognizable names (at least in North America). He will see a ton of ice time and will often match up against Team USA’s top lines. He’s also going to be the most physical defenseman the U.S. has seen yet. If Slovakia is going to have any success, Big Z is going to have a lot to do with it. Tomas Tatar — There’s a reason Red Wings fans are starting to get excited about this 21-year-old winger. He’s posted back-to-back 20-plus goal seasons in the AHL and while young, he’s now played three seasons in North America. He’ll get how to play against the U.S., while also knowing how to use the big ice to his advantage. Tatar has a lot to prove here. Miroslav Satan — Yes. He’s still playing. Satan spent the last two seasons playing in the Slovakian pro league with Slovan Bratislava, posting 62 points in 59 games last year at age 38. He has shown he’s still got some gas in the tank, as Satan’s spent more time on the ice than any of Slovakia’s forwards through two games (34:31). Satan may have lost a step or two, but he still has the skills that can make him a threat. Maybe he’ll give Buffalo Sabres fans something to get nostalgic about. Side Note: The U.S. still has two roster spots it can fill, if it wants. Players can be registered two hours before any game. Once a player is registered, he is locked into the lineup and cannot be replaced. The St. Louis Blues were eliminated by Los Angeles Sunday, which makes David Backes, T.J. Oshie, Jamie Langenbrunner, Kevin Shattenkirk and Ian Cole available. Their availability gives USA Hockey some pretty good options if it were to want to bring someone in. Backes and Langenbrunner were on the 2010 Olympic team, Oshie and Shattenkirk played at the Worlds last year and Cole (who was a black ace for the Blues, mostly) has World Junior experience. They might not get asked, and if asked, they might not say yes, but they’re all available now. Any one of those guys could step in and contribute immediately. Joey Crabb and Nate Thompson were teammates back in their youth hockey days in Anchorage, Alaska. Now they’re on the same line at the World Championship. Crabb actually helped set up Thompson’s big goal that gave the U.S. a late 4-3 lead over Canada. USAHockey.com caught up with the longtime friends. The venerable Kevin Allen of USA Today previews USA-Slovakia with quotes from Jim Johannson, USA Hockey’s assistant executive director of hockey operations. 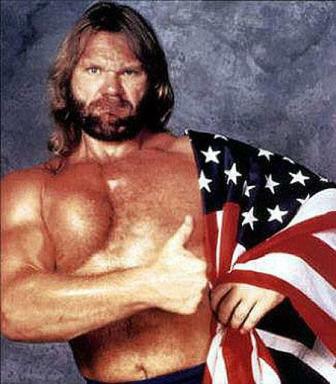 And finally, Zdeno Chara giving a thumbs up in a Pink Bunny Costume vs. Hacksaw Jim Duggan giving a thumbs up to Old Glory.